It’s been a decade since the last rare but beautiful sighting of Mercury crossing the sun appeared. Today, the event is happening again, and you can watch it happen here between 10:30-11:30 am (EST). 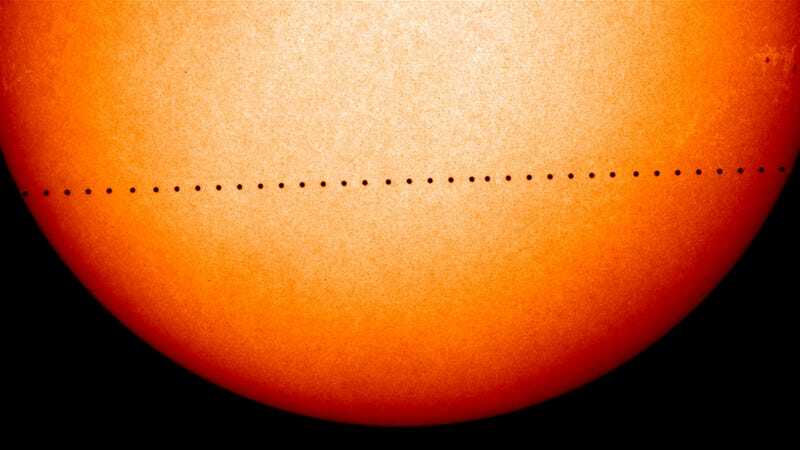 Mercury’s transit is visible when the little planet crosses between us and our view of the sun. This perspective lets us watch the planet’s progress in realtime, like in the timelapse photo from 2006 above. It’s a relatively rare sighting (this happens only approximately 13 times a century) that requires that Mercury, Earth, and the sun all line up together. The happening is more than just a good show. It’s also pretty useful to planetary scientists—though, curiously, the data they’re looking for is often not about Mercury at all. Instead, the slight drop in brightness from the sun blocked out by a planet, like Mercury, moving in front of a star, like our sun, lets researchers get a better view of dim exoplanets. At 1/285 the size of the sun, Mercury’s shadow during a transit may not seem like it would make a visible difference to the light of the sun, but it’s enough. Kepler scientists attribute at least a thousand planetary discoveries to observing similar drops in the brightness of stars during exoplanet transits. With a few exceptions (which you can see in the map—sorry, Australia), the transit is visible pretty much everywhere on earth. As always, staring at the sun is never a good idea. But there are plenty of other good ways to check out this event that don’t require special solar filter glasses. The European Space Agency and Slooh Observatory are both streaming the event in its entirety. You can watch Slooh’s feed from the Canary Islands right here with us. NASA will also be broadcasting the event on its main television channel from 10:30-11:30 am EST. Mercury first edged across the border of the sun at 7:12 am EST, and it will take just under eight hours to make the full trek. 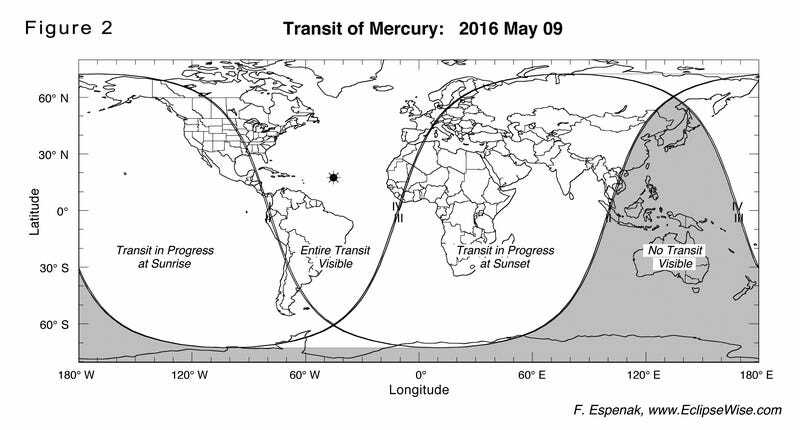 The best time to watch the transit is between 10:30 - 11:30 am EST. 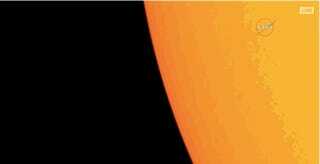 That’s when Mercury will be hovering around the middle of the sun, where it will be most visible. The whole thing wraps up by 2:40 pm EST. But those final moments, just like the beginning ones, aren’t likely to be good viewing. Of course, if you’re very, very impatient, you can also watch this NASA visualization of what the whole 7.5-hour event will look like condensed down into a tight 23 seconds. But the next two transits aren’t scheduled to come around again until 2019 and 2032 respectively, so you should check out the live version today while you can.